This flute is the first musical instrument in the history of humankind—one of the first examples of technology—which has surprised everyone demonstrating that music already existed 35,000 years ago. Stone Age Rock Band, here we go. It was made from the bone of a giant vulture during the Upper Paleolithic. 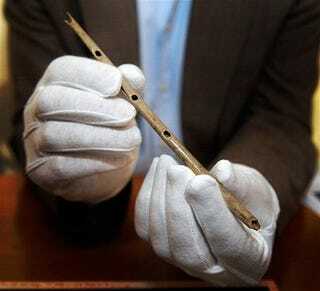 Found in Ach Valley, in the south of Germany, the 8.7-inch long, one-inch diameter instrument has five holes, with two V-shaped notches carved on one side of it. This was the part in which the musician put the lips to blow, according to University of Tubingen's professor Nicholas Conard, the lead author of the discovery. The other end is broken just on the fifth hole.